Surface preparation for most all pieces involves SSPC‑S.P.‑6 commercial blast cleaning to remove all oil, grease, dirt, rust scale and foreign matter by abrasive blasting. The first coat consists of an iron oxide primer and the top finish coat is alkyd enamel with one of our standard 17 colors. Chain guards and other safety enclosures are orange or yellow. 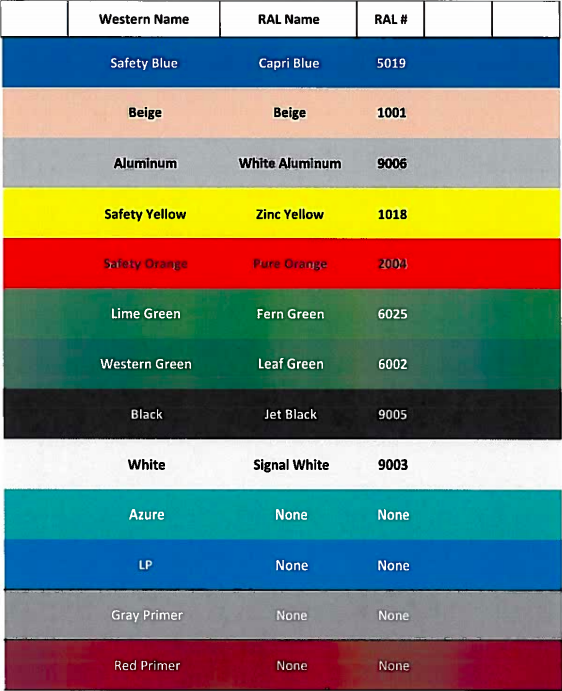 If one of our standard paint colors is not acceptable, we can offer pricing for a custom paint system. Disclaimer: WPI paint specification does not include the top coating of pre‑painted buy‑out items such as fans, blowers, actuators, reducers, motors, controls, etc. These items are supplied as received from the original manufacturer.